In our district, there is a great emphasis on success in math, specifically in Algebra. Because of our relationship with Carnegie Learning, I recently attended the 2015 Blended Learning Summit in Milwaukee, Wisconsin, along with one of the assistant principals from the other high school in our district. At the Summit, we spent a day in sessions hearing from terrific speakers, collaborating on specific issues and beliefs, and networking with each other to ask the question, "What's working at your school?" The second day of the Summit was a visit to a local middle school or high school followed by a debriefing session and working lunch. I feel so blessed to have been able to attend the Summit. The speakers were thought-provoking, the atmosphere created by the folks from Carnegie Learning was professional, friendly, and collaborative, and the educators we met from the middle and high schools were incredibly knowledgeable about not only their content, but about their students and where they were academically. The educators we met are redefining the traditional way of teaching and learning math at all levels. I really admire the way that they use data to know exactly what knowledge and skills each student needs. Their passion was obvious and refreshing, and I kept thinking to myself, "I wish our two teachers who are piloting the Carnegie algebra classes could hear this!" I have already emailed the middle school teachers and asked them if they would do a Google Hangout with our teachers, and today I'm going to share math-specific takeaways from the Summit and school visit with our teachers. I had several "aha" moments and took a lot of notes. 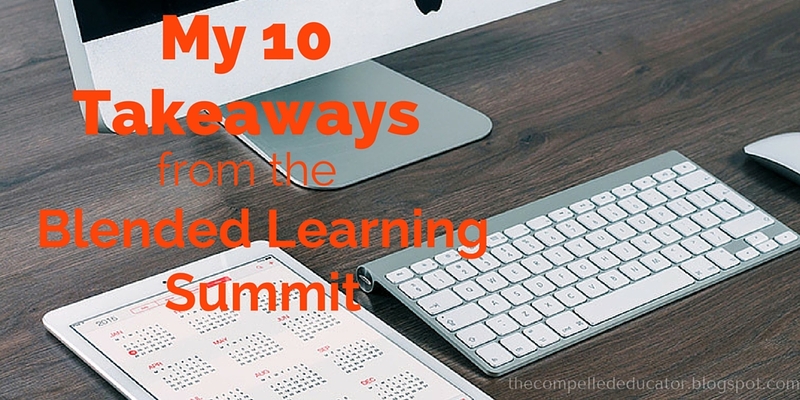 I've distilled them down into my top 10 takeaways that I'm sharing with you today. "We don’t know what jobs will be there in the future for our students. It doesn’t matter what jobs are out there. We know that students will need to know how to learn. We need to shift from facilitating learning to developing learners." Focusing on answers vs focusing on process - which one is more important? Are we making learning align with teaching or making teaching align with learning? Learning is enhanced through socially supported interactions. Are we using technology to create a new model or just digitize the “old” model? What’s the best use of face-to-face time between students and teachers? How has instruction changed as a result of technology implementation? There’s a disconnect between what kids are doing in school and what they think they will need outside of school. Which of these speak to you? Thanks for sharing Jennifer. Several of these points spoke to me, but the shift from a focus on answers to a focus on process really stood out. With the ability to access information all around us, we need to move away from rote memorization to learning how to find, analyze, and make meaning of information. That process will help create future-ready learners. Great post!